I have been saving up this recipe for red wine hot chocolate for today, because…TODAY IS MY BIRTHDAY! And when my birthday falls on one of my regular post-writing days, I always want to make it one of my most favorite recipes of the past year. And this rich, creamy, chocolate and cinnamon and red wine-infused cup of heaven is by far my favorite recipe of the past 365 days. It has almost all my favorite things in it. It’s positively decadent. It’s like a birthday in a mug. And so on my birthday (did I mention it’s my birthday?) I want to share it with YOU! Let’s make it!Now, I know some of you may be skeptical, and I understand why…but think of it this way. Have you ever sipped on a nice glass of merlot while nibbling a square of dark chocolate? And/or have you ever tasted one of those red wines infused with chocolate? This is the same concept, only taken one step further by upping the chocolate ante a whole lot. Trust me…it’s like no other taste in the world…creamy, dreamy hot chocolate with a hint of cinnamon and the mellow taste of red wine. It’s happiness in your favorite mug. Start with your favorite red wine. 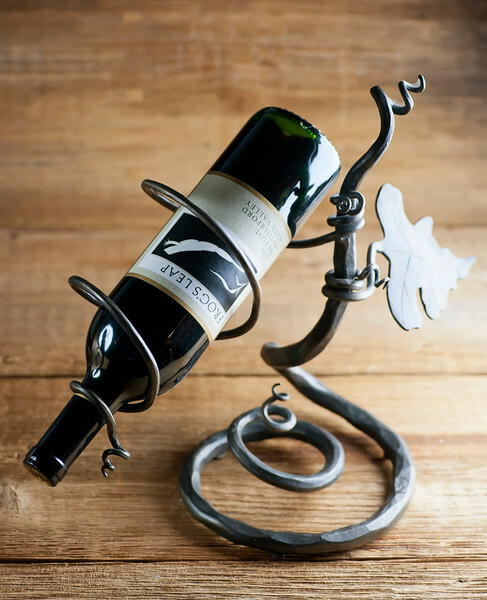 Mine is Frog’s Leap merlot, and here it is in our forged iron wine stand from Handmade In Vermont. The Southern husband got this wine stand for me eons ago, and it’s one of my favorite gifts of all time. …and of course Ghirardelli. 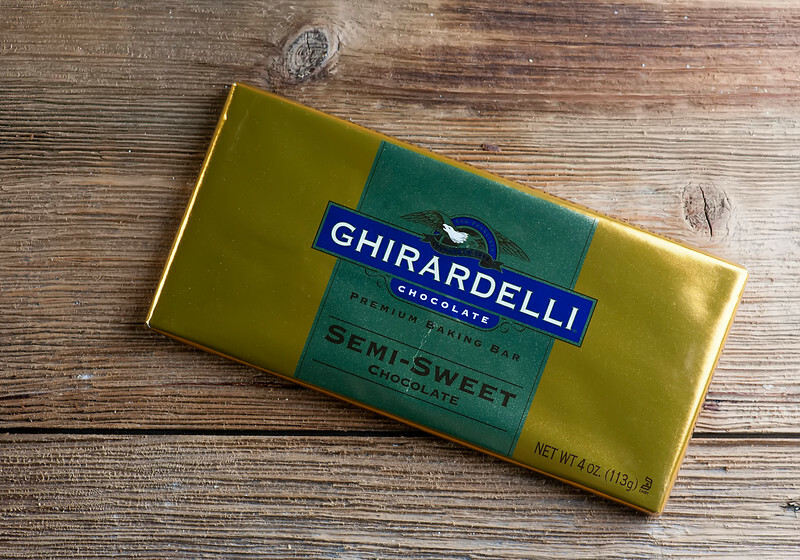 I have a particular soft spot for Ghirardelli because it comes from San Franciso, which is where the Southern husband proposed to me. Memories! You also need whole milk, a little confectioner’s sugar, some vanilla extract, and if you are going to go all in, some cinnamon sticks and a little bit of whipped cream. Heat the milk up to a simmer, and then whisk in the vanilla, the sugar and the chocolate. You want to chop the chocolate up in teeny pieces for perfect melting. Once the chocolate is melted, take the hot chocolate off the heat and pour in the red wine, and then pour into mugs or heavy glasses. If you are using cinnamon sticks and/or whipped cream, now is the time to add them to each serving. Now, as you may have guessed, this stuff is R I C H. So one of the ways I like to serve it up is in little shot glasses. 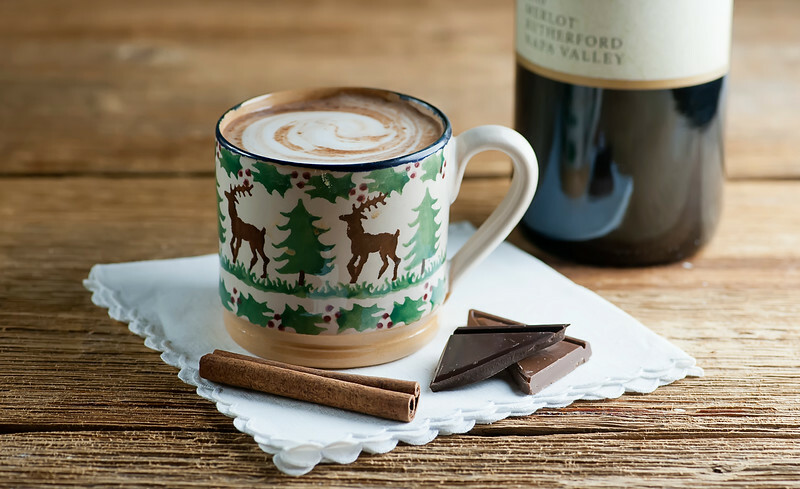 It gives the perfect amount of delectable red wine hot chocolate without going overboard. However, on your birthday you are totally allowed to go overboard. With a swirl of whipped cream on top and a little extra chocolate on the side. And finally, I can’t ever talk about my birthday without bringing up my very best birthday present of all time. 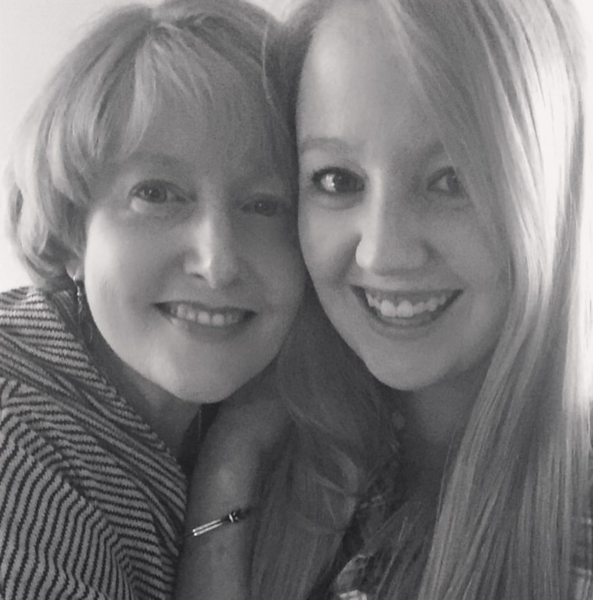 She arrived the day after my birthday 24 years ago today, and while she might have been a day late, she was definitely worth the wait. So happy birthday to this beautiful birthday girl too. Can’t wait to clink glasses of red wine hot chocolate with her! So happy merry times to you for everything you will be celebrating over the next days and weeks, and I hope you will drink a toast with some red wine hot chocolate! 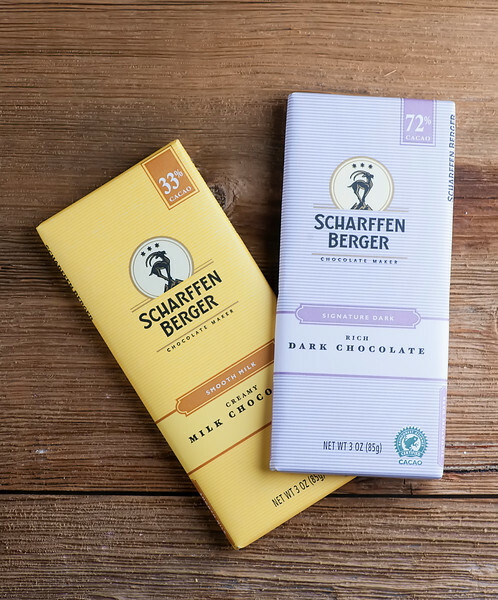 4 ounces of dark, semi-sweet and/or milk chocolate – your choice! Heat milk in a small heavy saucepan over medium high heat until it comes to a simmer. Whisk in sugar, vanilla and chocolate. Continue whisking until chocolate is melted and smooth. Remove from heat. Stir in red wine and divide among two small mugs or 4 to 6 shot glasses. Add a cinnamon stick to each serving if you like, and/or a tablespoon or two of whipped cream and enjoy! Happy birthday, Kate! I hope you (and your daughter too!) had a wonderful birthday. 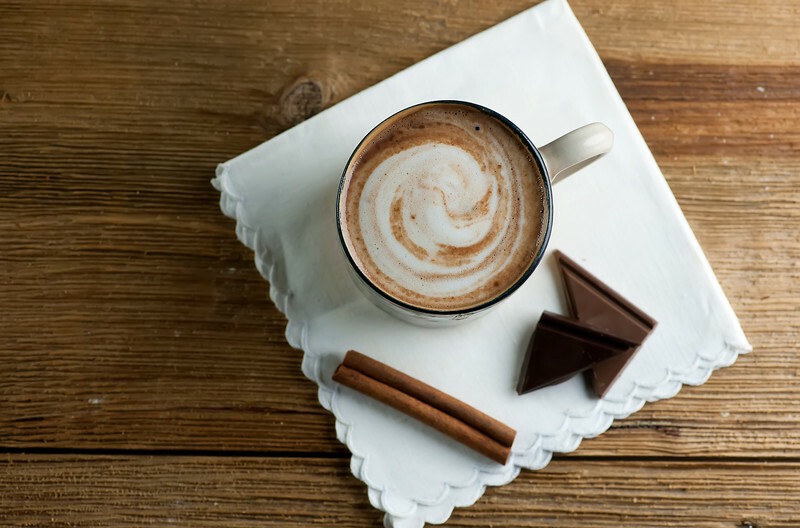 This red wine hot chocolate looks like the BEST way to celebrate! So creative and I have a feeling this would become my new favorite drink. Love it! I LOVE this idea…except Frogs Leap is such good wine on its own, I might squirrely that away and using a less spectacular wine…..AND YET, on your birthday and then the anniversary of the best present ever….there are no rules! Cheers. Happy Birthday from the San Francisco area!!! 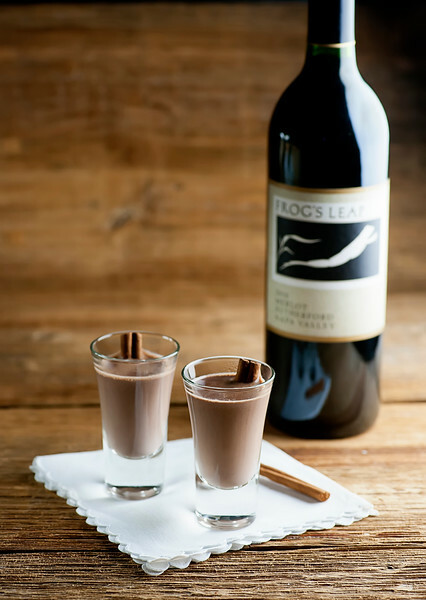 I love having a nibble of chocolate when I’m drinking a glass of red wine, so why not mix the two together? This hot chocolate sounds like a wonderful treat!